I am so excited to share that I just joined the team at the Luskin Center for Innovation! Together we'll be conducting research to better understand trail use practices and demographics to inform responsible, inclusive and diverse park programming. My work makes tiny appearance! 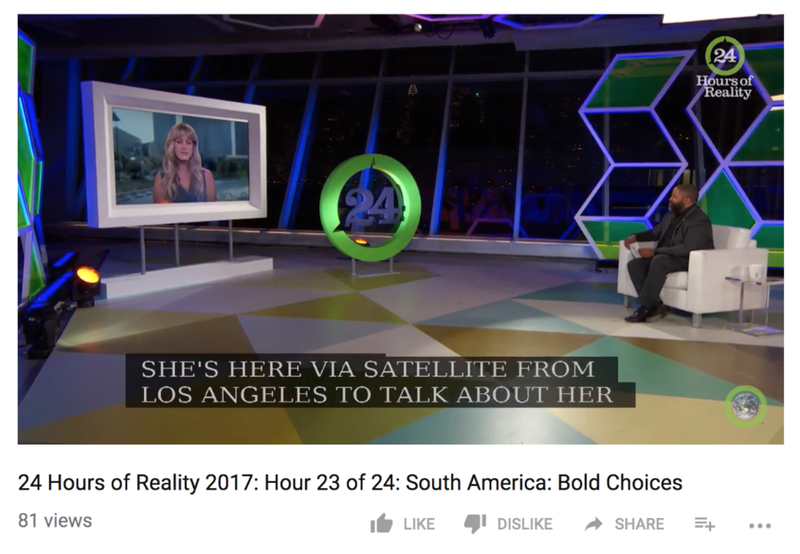 This past week I had the immense privilege of talking about my research and photography on the 24 Hours of Reality program. I was so honored to share the hour with Vice President Al Gore, Chilean President Michelle Bachelet, the Chilean Minister of the Environment, and other thoughtful musicians, artists, journalists, and news anchors. Peru has been in the midst of a natural disaster for weeks. What began as heavy rains, quickly escalated to raging huaicos, or massive landslide floods -- creating damage on par with dozens of Hurricane Katrina's across the country at once. Our mountain town was cut off from the world for a couple weeks. All roads had been destroyed. We lost access to many food sources, access to internet and phone service, and banks even ran out of cash as people panicked about the rising rates of what was left of local food sources. But we were hardly the hardest hit. In the country over 100,000 of people have been left homeless. Major infrastructure has collapsed, including hundreds of major roads, train tracks, and bridges. And 100 people have been killed. Those who are still affected are without electricity and running water. And infectious diseases are spreading at alarming rates (including anthrax, zika, and dengue fever). I will have a piece in Savage Minds about this soon, but until then, we're all just trying to be as helpful as we can be as the local mining company, trapped with us, works to resume operations by opening one of the roads. A truck that was parked next to the Rio Santa river was claimed by erosion, with it food and resources. The raging river continues to rise and endanger the lives of people who live closest to it. I wrote an article last year that was finally published! Of course, being along the Pacific, Peru is used earthquakes. I am used to earthquakes as an Angelino. But a magnitude 5.6 earthquake striking Huaraz last night at 1:50am was alarming. This region has a history of particularly catastrophic glacial lake outburst floods caused by earthquakes (from the 1941 flood that killed 5,000 people to the 1970 Yungay flood that killed 20,000). I highly recommend this interactive map which explains the current risks. Since I live in the starred area, you can imagine why I might be nervous during a pretty sizable earthquake. The red area indicates the maximum velocity and deepest flood zone (anywhere from 6-20m). Someone tried to convince me today that to find a dead body in the Rio Santa is a good omen: it means that the rains will begin again. Since the land has dried and hardened without rain this year, I suppose any sign is a good sign. And as it's currently raining torrentially, who am I to say they're wrong? My favorite fieldwork task: accompanying high-altitude glacier samplers. Wilmer and I spent 4 days this week on glaciers in the Shayup Quebrada, and up on Yanapaccha collecting samples of ice and snow at various locations. Goal: determine how much fresh black carbon was coating the glaciers from the highly polluting wildfires raging across the country. Most of the samples we took were covered in grey and black particles to be taken back to the donated equipment at his house for analysis. Dozens of people have just taken credit for the sabotage of a glacial lake outburst flood (GLOF) alarm system just above Carhuaz. Citing collaboration with the mine, local residents argued the equipment was responsible for the (very) late arrival of the rainy season. Naturally, the very next day heavy rain began. Tocosh potatoes are basically fermented potato pulp. Saved for pretty special occasions, they can take weeks (sometimes months) to prepare by soaking in stream banks. They also produce a natural Penicillin. Four Benadryl and a long hill-side nap later, all I've got is this pretty rash. Today we celebrated the lives and losses of friends and family members no longer with us. Yungay feels this. The old city was turned into a national cemetery after 20,000 people were killed in a glacial lake outburst flood in the 1970s. Many family and community members still practice this day of rememberence for them. We camped usually for seven days at a time, did our research and still had tons of time to explore the area on hikes and climbs. We found conditions to be frighteningly awful. In one valley the water ph was so low and acidic (2.6) that when we boiled ice for water, we stripped the kettle of its iron, and our water turned to rusty liquid within minutes. This was our water source for 24 hours! We also found that macro invertebrates couldn’t survive in these conditions and the delicate high alpine ecosystems were immensely struggling. As glaciers continue to melt, leaving high mineral deposits in water across the area, water quality becomes as important a question as water quantity. The team is currently out at Ishinca Valley, the last expedition for the season in this region, but after losing a battle with a gut-bug the last few days, I am enjoying some tea in town. I feel proud to have been a part of this team, and am incredibly eager to hear the final results!